Situated in Lower Bavaria where the river Ilz and the river Inn join the Danube lays the city of Passau. Built on the highest point in the old town is the St Stephen’s Cathedral. St. Stephan’s as we see it today was built in 1668 after a devastating town fire destroyed the late gothic cathedral that stood here before. St. Stephen’s is well known for the impressive pipe organ, built in 1733 by Joseph Matthias Götz. It was considered the world’s largest organ until the organ in the First Congregational Church in Los Angeles took over that honor in 1990. St. Stephen’s is a bishop’s cathedral and was founded in the 8th century. Since then it has always stood on this very spot. This is the fifth cathedral to stand here, the other four having been destroyed, rebuilt, destroyed and rebuilt. The plans for this cathedral were made by Italian baroque master Carlo Lurago. The interior stucco works and the frescos were also done by Italian baroque masters. The two towers of St Stephen’s shape the cityscape of Passau. This entry was posted in Germany, History on May 28, 2016 by lauralibricz. Today I’m over at Cryssa Bazos’s blog and we’re talking about a few of the many intricate events of the Thirty Years War and the profound effect on European and English History. Many of the later English Civil War leaders received their training during this time. It’s not an easy subject to narrow down into a blog post. Read more. by; after Balthasar Moncornet; Unknown artists,print,1620s? Cryssa Bazos is a historical fiction writer and 17th Century enthusiast, with a particular interest in the English Civil War (ECW). She is a member of the Romantic Novelists’ Association under the New Writers’ Scheme, the Romance Writers of America, the Historical Novelist Society and the Writers’ Community of Durham Region (WCDR) where she previously sat on the Board of Directors. Cryssa has published articles in the Word Weaver. Short stories include Confessions of a Tooth Fairy in Canadian Tales of the Fantastical (Red Tuque Books), Warwick Market in Canadian Tales of the Heart (Red Tuque Books), and The Dragon, appearing in Word Weaver. She has written articles for online E-Zines, Reading as Writers (RAW) and the Canadian Authors Association (CAA). She was the recipient of the WCDR’s Neil Crone Scholarship in 2011. Cryssa has recently completed a historical fiction novel, Traitor’s Knot, a romantic tale of adventure set during the English Civil War. Traitor’s Knot is the first in a series of adventures spanning from the ECW to the Restoration. This entry was posted in Germany, Guest Blogger, History, Writing and tagged #earlymodern #thirtyyearswar on May 24, 2016 by lauralibricz. This entry was posted in Germany, History, Video on May 21, 2016 by lauralibricz. You can find The Herbal Market Part 1 here. Adding freshly-picked sage, rosemary, lavender and basil to the cooking is a must for every good meal. Fresh peppermint ice tea augments any summer afternoon, just like warm peppermint tea made from leaves dried in the summer with honey eases a cold winter’s evening. These plants are also cultivated on a large scale to satisfy the demands of a modern market. In the Aisch River Valley, at the base of the low mountain range Steigerwald in Franconia, growing herbs for mass distribution is the work of farmers like the Martin Ochs in Mailach. “The soil is fertile in the hollow where we farm called the Edelgraben,” says Martin Ochs. He points to a blooming field of purple flowers as we drive by. 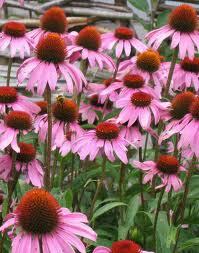 “This is echinacea (Echinacea purpurea or Rudbeckia purpurea). They will be ready to harvest now. And there: there’s the field of tropaeolum that we harvested two days ago.” During the harvest there is no time for an interview, he says, but I am welcome to accompany him on his tractor. Acting as President since 2009, Martin Ochs is also responsible for the EZG management. The EZG acts as the contact for buyers, leads contract negotiations and closes cultivation contracts. It handles the ordering of seeds and seedlings as well as packaging material. It is committed to improvements in cultivation (market trends, mechanization) and processing (energy requirement for drying) and cooperates with institutions of research and development. The EZG Group for Medicinal, Spice, Perfume and Aromatic plants w.V. Aischgrund attaches great importance to the fact that research and development projects need not be only the concern of the producers and the buyers, but government advisers and research institutions are also included in furthering the quality of production. A total of 402 hectares are cultivated between the seven member companies. In 2004, 145 hectares were planted with cultivated herbs. For the most part, cultivated herbs are marketed as a dried product. The member companies now have seven drying facilities at their disposal. The dried herbs are then bundled and shipped for further testing and production. What started in 1930 as the Herb Processing Plant Martin Bauer in Vestenbergsgreuth in Franconia, Germany is today the world’s largest supplier of herbal and fruit infusions. Three companies make up the Martin Bauer Group : Martin Bauer, also making medicinal teas, refined green and black teas, herbal powders and botanicals; Plantextract, making fruit and herb extracts, black and green teas, and Finzelberg, making herbal extracts for phytopharmaceuticals and nutritional supplements. These companies are globally active in a group known as the nature network®. Consumer awareness of healthy and natural ingredients has increased enormously in recent years: the consumer of today is much more attentive to the lists of ingredients on the product’s packaging – one reason is because of the increasing number of food allergies and intolerances. Healthy and natural products are higher in demand than ever before and a naturally grown product like tea fits into this trend. Martin Bauer supports this trend by compiling tea blends that meet the high demands of consumers for taste and naturalness, for example committed U.S. customers who demand high quality and ethical standards of the ingredients / herbs and their origin. They also offer a wide range of products with seals of quality such as “organic” or “Fair Trade”. Their mission, what they call the Holistic Corporate Responsibility, is firmly anchored in their corporate culture. Specifically, this means they maintain a fair partnership with their staff and with their global business partners. Production methods of herbal raw materials are conducted in a manner to conserve nature – so that the diversity of today’s resources will be available for future generations. This is done by using environmentally-friendly technologies. And the Holistic Corporate Responsibility in the nature network ® is a commitment to social, sporting and cultural projects in the areas in which they live and work. This entry was posted in Food and Drink on May 16, 2016 by lauralibricz. Using herbs and spices to refine foods, to soothe body and mind and to heal has a history further back than the written word. Enthusiasts still collect wild herbs and, with the guidance of a qualified consultant, identification can be fun and rewarding. Traditionally herbs and spices were cultivated in monasteries, where the monks and the nuns studied the value of herbs for healing purposes. Many of these plants are readily available today and can be grown in any home garden. On a larger scale, growing herbs and spices for teas and pharmaceuticals, controlling their quality and getting them out onto the global market is a science in itself. What German child can forget Oma’s fennel tea for an upset stomach, chamomile tea for any uneasiness or sweating out a cold after drinking linden blossom tea? These teas and herbs are bought today, packaged and ready-to-use in any supermarket but are considered remedies by the Deutsche Arzeneibuch and should be treated as such. Because of this, certain teas, like Echinacea, are only available in German pharmacies. Other herbs are considered weeds, their positive properties once well-known, and their popularity stays alive through classes offered by dedicated educators known as Kräuterpädagogen. And the springtime is a fine time for a herb hunt. What the hobby gardener considers a nuisance can be for the herb enthusiast a blessing. Pulling stinging nettles (Urtica dioica) out of the garden can be a painful experience. But they are rich in vitamins A, C, iron, potassium, manganese, and calcium and have a taste comparable to spinach. It’s advisable to blanch the leaves before eating; the fine hairs on them can irritate the urinary tract when eaten uncooked. Goutweed (Aegopodium podagraria) is also a nuisance in the garden. The name itself stems from its main use in medieval times. Although rich in vitamins, like the stinging nettles, studies today show that it contains no real healing substances to treat gout and arthritis except potassium. But it can also be cooked like spinach or added to a tasty quiche. 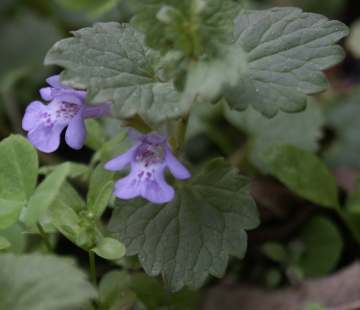 Found under trees, the white dead nettle (Lamium album) and ground-ivy or creeping charlie (Glechoma hederacea) have anti-inflammatory properties. Both can be used as an expectorant. Tea steeped from the leaves makes a tonic for colds or the leaves can be freshly picked, chopped and added to a meal. But ground-ivy is known to be poisonous for horses and rodents. That is one reason to begin collecting wild herbs with an expert. Some plants are easily mistaken for other, more harmful relatives. Tender, springtime pine needle sprouts make a superb jelly. They are best collected in May. The needles are boiled, left covered steeping overnight and then shortly brought to a boil the next day. The liquid is then drained off and prepared like any other fruit juice jelly, with pectin and sugar or honey. Another alternative: the sprouts soaked in Korn with sugar make aromatic liquor. 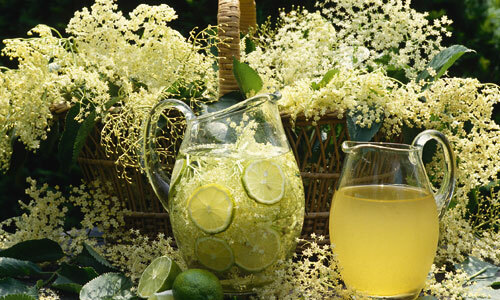 Blossoms of all sorts can be collected and transformed into exquisite drinks or snacks. Teas of the pungent elder blossoms (Sambucus) blooming in late May or early June, have been used internally to treat the flu, bronchial infections, and externally to treat measles and sunburn. A old saying goes, “When you see the elder tree, tip your hat and get on your knee.” The blossoms can be steeped for tea, made into a skin lotion, dried for storing, soaked in water with sugar and lemon to make refreshing lemonade, steeped in thick, sugared water for syrup; even soaked in schnapps to make liquor or dipped in a batter and fried like tempura. The hawthorn (Crataegus) blooms white in the spring, too. The fresh or dried flowers are used as a tea or alcoholic extract for heart and circulatory disorders. The list of wild herbs native to Germany goes on and on. Other plants and medicinal herbs, some winter hearty and some not so, and the knowledge of their properties came to northern Europe with the monks. In the monasteries, the nuns and monks polished herb and spice cultivation. The history of the monastery gardens goes backto the founding of the first Benedictine monasteries in Italy. The Romans had developed the cultivation process and the Benedictines were able to draw on this knowledge.They not only brought the knowledge but also plant seedlings into the monasteries north of the Alps. Monks and nuns also traded medicinal plants from seed and their cultivating experiences among themselves. This entry was posted in Food and Drink, Germany on May 14, 2016 by lauralibricz. 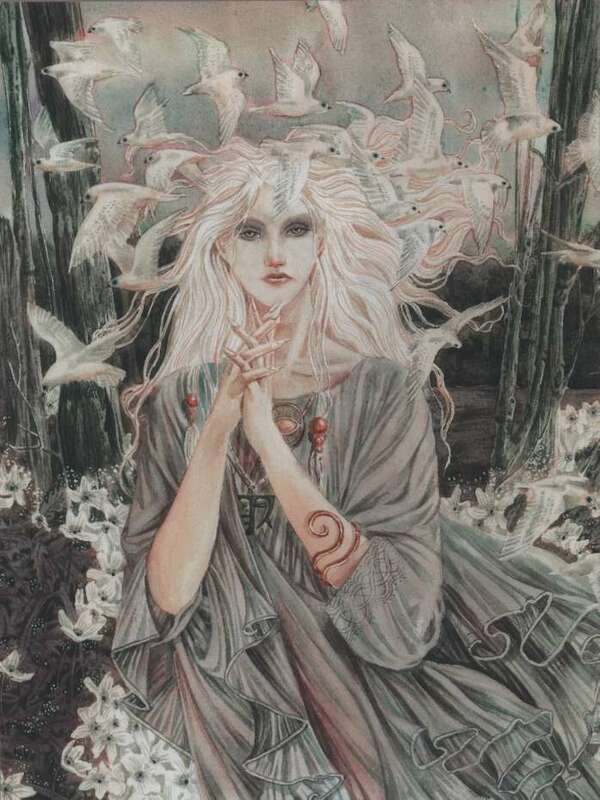 Sybille sat behind the ancient willow tree. One side of the tree was brown and decayed; the other full of lush grey-green leaves. Its trunk had been split by a lightning bolt one night in the spring when sudden rains had flooded the village. Sybille peeked around the tree’s wide girth. She saw a young woman struggling on foot up the path towards the forest. The young woman fell to her knees, tried to crawl on all-fours then stood again. She cupped her massive belly with her two arms and plodded on up the path. A white flash of light struck Sybille from somewhere deep behind her eyes. She could no longer see. This happened so often these days. She’d learned to breathe evenly, relax and let the vision come. The white flash of light took shape. She saw the young woman, a beautiful girl but sad. She was to deliver a child, alone in the forest. Then she would die. Sybille could do nothing to change the woman’s fate. Sybille had seen many things in the past. She told the villagers of her visions: one day people would travel in wagons that needed no horses; a great plague would befall mankind; there would be a war that would desecrate Europe. Her name would adorn history books as the greatest seer of the age. The villagers had banned her from her house. They forced her to live in the stone house at the top of the North Hill under four linden trees. The trees once served as gallows. Her only companion was a black rabbit that was as old as she herself, and she was generations old. Sybille could do nothing to change her own fate, either; this ancient curse. The vision faded and she wiped the sweat from her brow. She peeked around the split willow trunk but the young woman was no longer on the path. She stood and followed the same path, towards the forest, hoping to find the young woman. Pounding hooves forced Sybille to jump down from the path into a ditch. One, two, three, four horses she counted. After they passed, she stood, smoothed her white dress and continued into the forest. A woman’s voice whimpered and sobbed. Sybille caught sight of the man through the trees, his sword drawn and dangerously close to the woman’s neck. The woman sobbed and pleaded. As Sybille came closer, she saw the bloody mess surrounding the young woman that must have been caused by the child’s birth. But where was the child? Sybille steadied herself against a young oak as another white flash slowly overtook her eyesight. The white flash took shape and she saw the young woman’s newborn baby, quiet and unmoving. But the baby was alive. The baby was a miracle. The baby was destined to be a legend, too. Sybille must rescue the child. That much was sure. The vision faded. She heard a sword swing and a thud. She rubbed her eyes and saw what was left of the young woman crumpled on the ground. Her head lay next to the afterbirth. The men mounted their steeds and rode out of the forest. A hawk cried overhead. She ran to the young woman, her eyes searching the bloody scene for a trace of the child. Her heart raced as she heard another horse approach. Only one. A man the color of the forest came into view, jumped from his horse and ran to Sybille’s side. “She’s dead. But the child lives,” Sybille said. He said nothing. A peep like a baby bird sounded from the ground beneath the young woman’s cloak. The man the color of the forest bent down, threw the cloak aside and raised the child up high. “This is our child,” he said. The man jumped lightly and settled on the horse’s back. The hawk flew through the trees and lighted on a tree stump. “You will only stop when the horse stops. He knows where to go,” Sybille said. She wrapped the baby in the woman’s light blue cloak and handed the package to the man. The hawk flew off the stump and out of the forest. Sybille slapped the horse’s behind and he bolted in the same direction. This entry was posted in Heaven's Pond, Short Story, Writing on May 9, 2016 by lauralibricz. Laura tried to do the “right thing” and study something useful, but she spent all her time reading German literature. The result is the richly textured, Heaven’s Pond Trilogy, set in Bamberg, Germany at the time of the Thirty Years War. Allentown, Pennsylvania—May 5, 2016—Blue Heron Book Works, LLC is pleased to announce the publication of Laura Libricz’s first novel, The Master and The Maid, the first book in The Heaven’s Pond Trilogy. Ms. Libricz will be signing her book on Friday, June 10 from 4 to 7 PM at the Moravian Book Shop in Bethlehem, Pennsylvania. The Master and the Maid is a historical novel which places the main character, Katarina, in the suspect position of being an unmarried woman raising a child at a time when single women were routinely burned as witches for offences as seemingly innocuous to us today as an extensive knowledge of herbs or dancing. Her impetuous choice in love forces her to return to Sichardtshof, the country estate where she was raised, to care for her aging grandmother and a baby foisted on her by a desperate huntsman, and to deflect the advances of Sichardtshof’s new master. This entry was posted in Bamberg, Books, Germany, Heaven's Pond, Writing and tagged #bookrelease on May 7, 2016 by lauralibricz.